Giveaway is open to Worldwide Residents, ages 18+ years of age (limited to one entrant per household). Simply follow the Rafflecopter entry form below for chance to win. Be sure to return tomorrow to complete the daily entries! Good luck! Disclosure: The participating bloggers were not compensated for this post. We are not associated with any of the companies named above. No purchase is necessary to enter. Void where prohibited by law. The odds of winning are based on the number of entries received Open to Worldwide Residents, 18+ only. Limit one entrant per household. Confirmed Winner(s) (by Random.org) will be contacted by email. Winner(s) have 24 hours to respond before a new winner is chosen. No purchase necessary. Void where prohibited by law. I am in great need of a nice new bicycle to get my nephew for Christmas. A book or 2. Thank you. I would spend it towards baking supplies. i would buy my sister a baby shower gift. I would put it towards a lighted magnifying makeup mirror. I would get winter boots for my oldest. I would get winter boots for my ooldest. I would buy some office supplies for school! We buy so much from Amazon that I would have no problem spending this prize. Probably books for my Kindle. I would like to get a new book or pair of earphones. It would go into the Christmas gift purchase money. I would probably use it toward a birthdsy gift for my sons upcoming birthday thanks for the chance. I would use the gift card to buy Mamma Mia 2 on Blu-Ray. Thanks for the chance! I’d use it toward my Amazon Prime Membership. I’d buy something for my kids! We just ordered a “big boy” bed for our son so I would love to use this towards some new sheets for his bed. I’d use it to purchase patterned leggings. Thanks. I would use it for calligraphy tools. I’d probably buy some new books! I would use it towards a printer. We just ordered a “big boy” bed for my youngest so I would use this towards some new sheets for him if I was lucky enough to win! I would buy myself a little bday present in January. I honestly don’t know what I’d get with this….probably some necessity. Thanks and God bless! 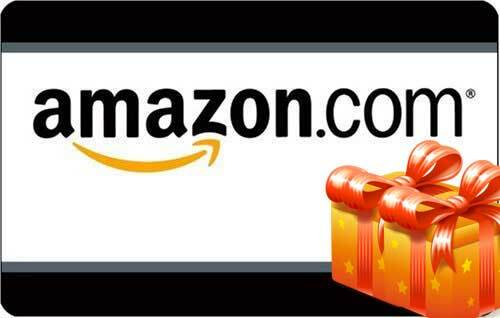 I would use the $15 Amazon Gift Card towards renting a holiday movie for my family to watch on Christmas Eve. I would purchase some k-cups if I won. I would buy a cat toy. Most likely a DVD for my granddaughter. I’m done with Christmas shopping for the kids, and my husband decided he wanted a gaming chair for Christmas so we already purchased that for him. All that is left is me! I’d would put it towards my balance to go towards a new pots and pans set for myself, because that’s what I want for Christmas. I would buy a cd for my father-in-law for Christmas. I would put it toward work clothes for my hubby or a birthday gift for my daughter. I would get my son something Mario. that is all he wants for Christmas! I’d likely purchase a book with the gc. I would probably purchase a toy for my dog. If I won I would purchase some books to read over the next several cold months. A book for my daughter. I would put it towards Christmas items. I think I would head to the kindle store and buy some ebooks. I would buy some beard soap for my husband and rent some movies. I’d probably buy books hehe. I would probably buy a mystery or thriller book. I’m sure I can find something on my massive wish-list to purchase. I’m sure I could find something on my massive wishlist I could buy. I would buy movies if I won. I would buy handmade soap. I would purchase a new wallet. Maybe a book of something for myself once. If I won I would buy my husband a book to read. I would get books for my daughter’s classroom. I would buy some thick gloves and socks.. I would put it toward a new toaster oven. I would put in on a computer. I would buy a book for my niece. I would get some coconut aminos. I would buy myself a book or two. I will probably put this toward another book! I would put it towards some books for my sons birthday. He is specifically asking for the Goosebumps series. I would put it towards a laptop I’m saving up for. I WOULD USE THIS TOWARDS THE PURCHASE OF SUPER SMASH BROS FOR SWITCH! I would purchase my next book club book. Absolutely a present for my son. Single mommas I got this. Keep ya head up. If I werre lucky enough to win Id put this twards my hubbys present. I do need a new cell phone case for my new cell phone, so that is what I would purchase from Amazon. I would put it towards a new laptop for my daughter. I would buy myself some nice fuzzy socks if I won! I would let my grandmother pick out a book. I’d like to get a picture book for my son. I have a couple of games in mind for my kiddos. Zingo, Not Parent Approved, and Uno Attack! The gift card would help with that! Thanks for the chance. Thanks so much. I think I would be saving up for some warm socks. Thanks so much. I would buy a new charger for my computer! I would buy some printer ink. I would put it toward a Kindle Fire. I would get one of the (many) cookbooks on my wish list. i dont know,. my kids always want little things! I am wanting to get a pasta maker, and I would use this to get one. I think it would be a lot of fun making pasta with the family. We love kitchen time. I would get some books for my 18 year old daughter that she has on her Christmas list. I might have to get some essential oils too. I would buy some books for my 18 year old daughter that she has on her Christmas list. I might have to get me some essential oils too. I would purchase a new curling iron. I’d get something for my daughter. Probably something Minecraft related. I would put it toward a second stage diving regulator. I would buy some books..
Would put toward a video game for my sons. I would buy an essential oil diffuser or a cookbook. I would buy food for our 3 Kitties. I would purchase a book I’ve been wanting to read. I’d get some last minutes gifts for the family! I would buy an item from my ideas list – maybe a new beauty product that I would like to try. I would use it towards my monthly subscribe and save items! I would use it to buy supplies for my business. I would put this towards a drawing tablet for my son – it calms his anxiety to draw. Right now he goes thru papers, I’d like to tryto purchase a tablet for him. I would buy books as Christmas gifts. Thanks. I would get my daughter new books! I would get Julian Castro’s new book. I would purchase movies or books. I would buy some cute socks. I’d buy books and/or something fun for my kid. I would probably get something electronics related. I would buy a new watch for my brother. I would buy a memory card for my camera so I can take lots of photos this Christmas. Thank you for the chance to win! I would buy books for my mom and I. My kids have made their Christmas wishlists and almost everything is on Amazon! I’d probably order my son’s Starlink game. I would put the gift card towards a gift for my husband. I would by some winter clothes. I would purchase a book. I have several on my wish list. I would purchase a new coffee maker. I would put it towards an outdoor security camera. I am ordering my son a pair of Doc Martens. I would definitely put this gc towards that if I won. I would get some stocking stuffer gifts..
A dvd for my son. I would buy some socks! I would purchase a bottle of Nautica Blue 3.4 oz for my son. I would probably buy myself a book. I would purchase a book since I am an avid reader. If I win, I would use this towards a new lego city set for my grandson! I am always in need of compression stockings due to a previous DVT. Amazon has one of the best prices yet they are still pricey. This would help in that purchase. Christmas gifts it’s before the holiday; otherwise, books! I have 5 kids always in need of something. Most likely it would be a pair of gloves or a winter hat. They tend to lost many pair of gloves all winter long.